‘I was eternally grateful of our position on the catamaran as I saw excursions drop sightseers on the glowing sand, only for them to leave an hour later. Mark knew some of the locals working on other boats and one young guy came over to chat. He was skippering a boat loaded with National Geographic photography students. After a day of picture taking, they had put down their cameras and were off to play cricket on the beach. We declined an invitation to join them, as I was currently unable or unwilling to remove myself from the comfy cocoon of the hammock. Who needed cricket when we could enjoy dinner overlooking the water, watching turtles pop their heads up. Lei spotted a whale in the channel between the beach and another island. 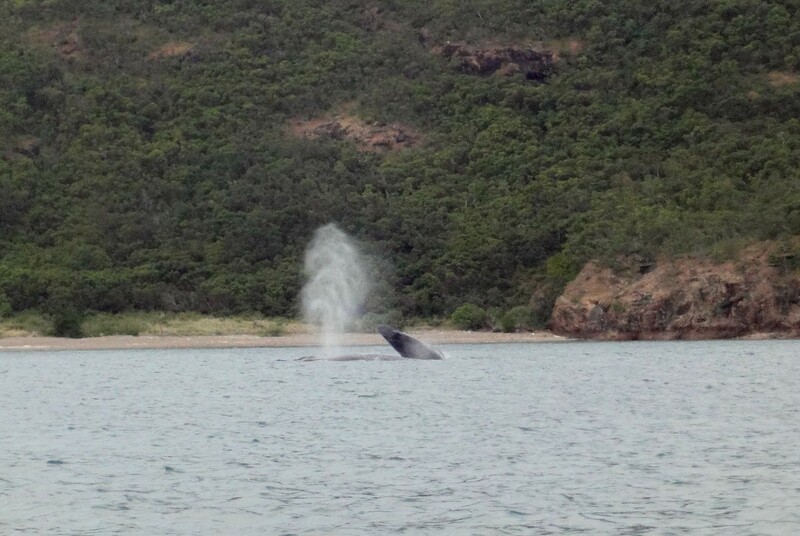 Through the binoculars we could see the top fin and a small piece of its back hovering above the water. It wasn’t moving which seemed rather unusual and twenty minutes later it was still in there. Concerned that it might be injured or beached, Mark asked if we wanted to have a closer look. I wanted to jump up and down with excitement; in fact I think I did. 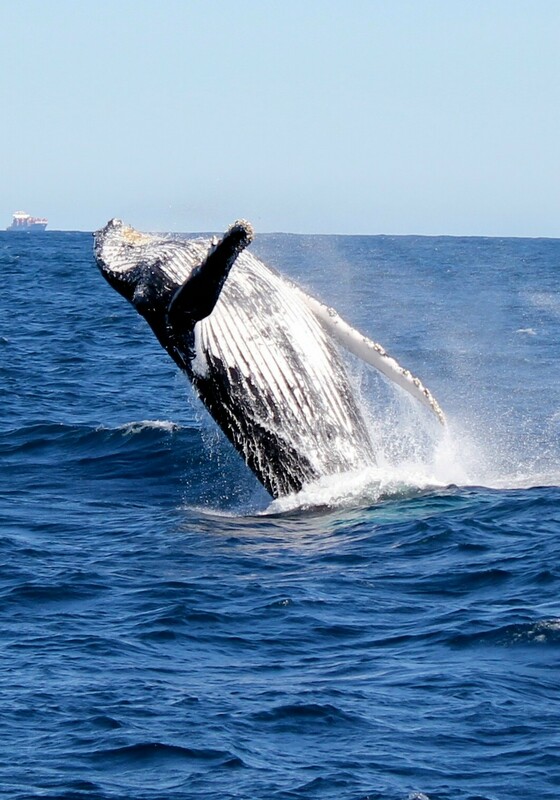 It was illegal to get too close to whales, but we were going to keep at the regulated distance with our motor off. Hopping into the dingy we headed out. By the time we had crossed the channel, the whale had turned upside down leaving only the end of its tail standing upright out of the water. I joked that she should put on more of a show, but as the minutes past all was still. In awe we silently looked on. All we could hear was a gentle splashing as the wind whipped the ocean and suspense began to build. Still nothing happened. I was beginning to wonder what we would do next and whether we should give up and return, when patience finally paid off. Breaking the surface a baby suddenly appeared alongside its mother. We presumed that she had either just given birth or had been feeding. I was delighted as the baby repeatedly jumped out of the water, landing with a splash. After ten minutes of this energetic display, side by side mother and baby began to move. We were a little concerned to see that they were heading our way. Then the mother nosed up and turned downwards, appearing to dive and we waited with anticipation to get a view of her huge tail. Then the unexpected happened. About a hundred meters from our little dingy, the adult whale’s barnacled head emerged in a froth of waves. She was massive and as if in slow motion, she rose up out of the water, revealing more and more of her incredible bulk. The black shiny body dwarfed the precariously rocking dingy. We sat frozen, half in awe, half in fear as the huge mass of mammal, propelled herself further up and into the air, displaying her lined, white belly. The fin on her side must have been larger than our boat and it shone sleekly in the sunlight as her whole body cleared the water. Want to work in the outback? Live on a hippy commune?